Home / Avengers-4 / Avengers-Infinity-War-2018 / Black-Panther / Black-Panther-2018 / Comics / Letitia-Wright / marvel / Shuri / 5 Reasons to Be Excited About Marvel's New Comic Book "Shuri"
5 Reasons to Be Excited About Marvel's New Comic Book "Shuri"
Marvel has announced a new comic series following the adventures of Black Panther's genius little sister Shuri. Marvel Entertainment and IDW Publishing announced this week that the companies will develop middle-grade comic books designed for younger readers. The monthly issues and trade paperback collections, published by IDW, will be available for sale at local comic book shops and book retailers across the country. 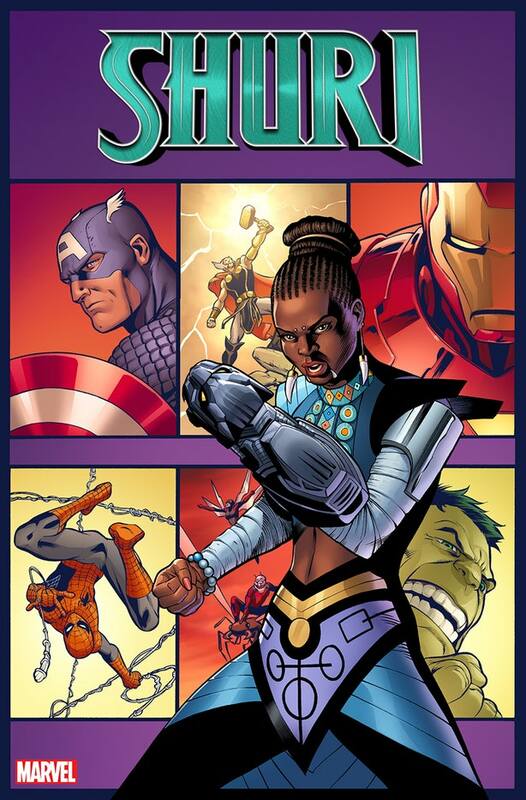 Among the announced titles is "Shuri" focusing on the sister of the African superhero Black Panther. Created by writer Reginald Hudlin and artist John Romita, Jr. Shuri has been in the comics since 2005. But she became the break-out star of the "Black Panther" movie. Shuri is the Princess of Wakanda, sister of T'Challa, daughter of T'Chaka and Ramonda, and the leader of the "Wakandan Design Group". Played by Letitia Wright she's the genius scientist behind much of Wakanda's modern technology. Her quick wit and sarcasm quickly made her an audience favorite. Shuri has starred in "Black Panther", "Avengers: Infinity War" and the upcoming "Avengers 4" movie. Here are the cover and five reasons you should get excited about the series even if you don't normally read comics. Of the 41 current Marvel comic series running there are only four that focus exclusively on a minority character. First, "America", which focuses on Latin-American superhero America Chavez. Second, "Black Panther" which follows the adventures of the African king T'Challa. Third, "Moon Girl and Devil Dinosaur", which follows Lunella Lafayette and her dinosaur companion. Finally, "Ms. Marvel" which follows the teenage Pakistani American superhero Kamala Khan. "Shuri" would expand that number to six if you include the newly announced Spider-Man series that includes black superhero, Miles Morales. That's still a small portion of the overall line, but it's getting better. The importance of diversity in the media has been covered many times and has been proven to reduce prejudice and negative stereotypes in young people. Of the on-going Marvel titles, only six have a woman in the lead. "All-New Wolverine", "America", "Jessica Jones", "Moon Girl and Devil Dinosaur", "Spider-Gwen", "The Unbeatable Squirrel Girl", and "Rogue & Gambit". Considering the number of female superheroes in the Marvel universe that's very low. "Shuri" could move the needle forward. But if you think this series is just going to be about a little girl waiting for a prince to save her think again. "Don't let the title of 'princess' fool you," Okorafor warns. Award-winning Nigerian-American writer and afro-futurist author Nnedi Okorafor is writing the series. 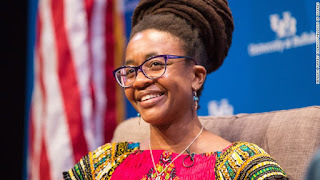 Okorafor is best known for her best-selling novel titled "Who Fears Death". It got multiple award nominations and a World Fantasy Award for Best Novel, but it's also becoming an HBO series with executive producer George R.R. Martin. Besides those works, she's also contributed to the comic book universe. She worked on several issues of the Black Panther comic series "Black Panther: Long Live The King" along with Ta-Nehisi Coates. Okorafor is also working on "Wakanda Forever" series which follows the African warrior women called the "Dora Milaje". She knows how to handle strong black women and will make the series great. Women in the tech industry are already under-represented. This series has the chance to bring women into science and engineering. "[Shuri is] an African young woman of genius level intelligence who is obsessed with technology and has traveled spiritually so far into the past that she's seen Wakanda before it was Wakanda. The Ancestors call her Ancient Future. And she's super ambitious. What do I love about her? Alllll that and more," Okorafor tells Bustle via email. "She's a character in the Marvel Universe who really sings to me." In the comics, Shuri has become the leader of Wakanda before, became Black Panther for a while, died and returned from the dead, but it looks like this series is taking it in a new direction. The series is described as starting with Black Panther "lost in a mission in space, leaving Wakandans asking questions about who should lead in his absence". Since his little sister is next in line for the throne she is forced to step into the role as leader. 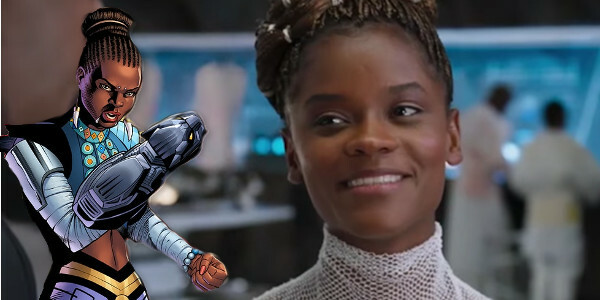 The official Marvel synopsis says, "Shuri is happiest in a lab, surrounded by gadgets of her own creation. She’d rather be testing gauntlets than throwing them. But a nation without a leader is a vulnerable one — and Shuri may have to choose between Wakanda’s welfare and her own." Women face many challenges in a leadership role and this comic can help open doors and show that women can be a strong leader. In a press release, Marvel and IDW said why the series is important to the company. The new IDW series kicks off in October 2018 but the exact date of the "Shuri" series hasn't been announced. Are you looking forward to the "Shuri" solo comic book series?